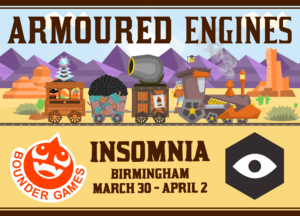 Grab your conductor hats and start your engines – Armoured Engines is coming to Insomnia Games Festival at the end of March! A full vertical slice demo will be available on the show floor, so come by and give it a go. 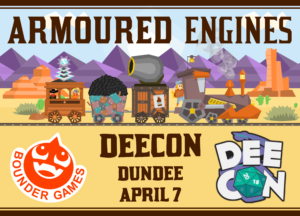 Armoured Engines returns to the Dundee University Student Union this year for Dee-Con! Come by for a day full of costumes, art, and of course – games! We’ll be in the indie game section, so drop by and say hello! 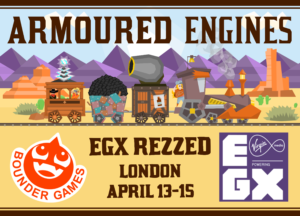 Fill your boilers with steam and sound your whistles – Armoured Engines is headed back to London for this year’s EGX Rezzed gaming expo! Swing by and check out some fabulous indie games, including ours! 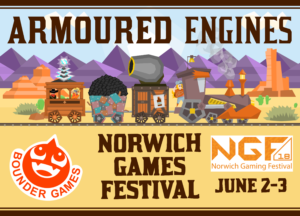 The Armoured Engines expo train is pulling in to Norwich this summer for the Norwich Games Fest! This fabulous little fest is one of our favourite events, and we’re very happy to be returning this year along with some amazing indie gems!